This pair of very tall antique Chinese carved calligraphy hanging plaques are wonderfully carved with beautiful poetic phrases reading: Seeing the pattern of a dragon curling its body, one imagines how the ancient Eastern Way connecting to the furthest Western End (right plaque); Upon seeing the fourth star “Fang-Su (房宿) ” residing in the vast universe, one can't help at the present moment looking up to the South Sky and feeling an admiration for the far away North Star (Polaris) surrounded by other stars (left plaque) . A dragon curling its whole body is a motif and design often seen on the ancient Chinese bronze vessels from the Western Zhou Dynasty. Here, this implies one's longing for the ancient time of the profound culture by being fascinated with the dragon pattern of such object. The Eastern Way might be a place in Yunnan that was set up to govern surrounding locations during Kangxi emperor's reigning. It can also be another place in Jiangsu province. The Western End could mean west of the Chang-an city, or it could also simply mean the endless western bound. So, a traveler might be on his mission traveling through the western part of China and even through the inland silk road as well. 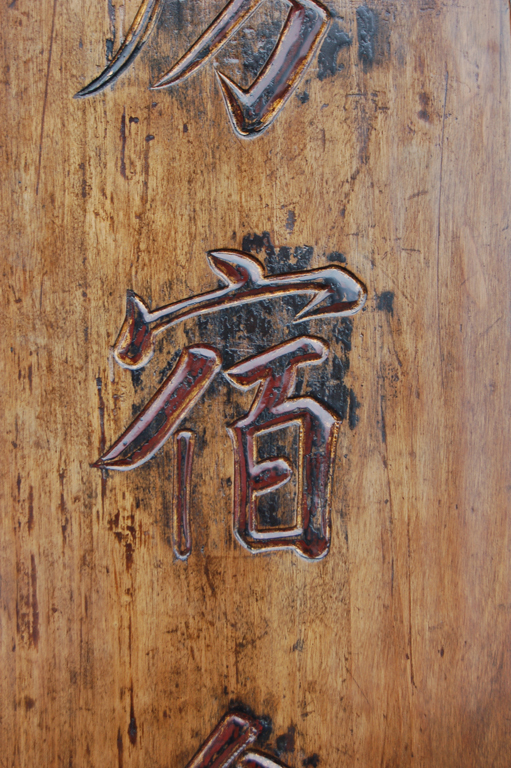 The “Fang-Su” star is part of the Daoist 28 celestial star systems. This star actually is a group of four stars and is supposed to hold the essence of the sun. It is also named “Heavenly Horse”. 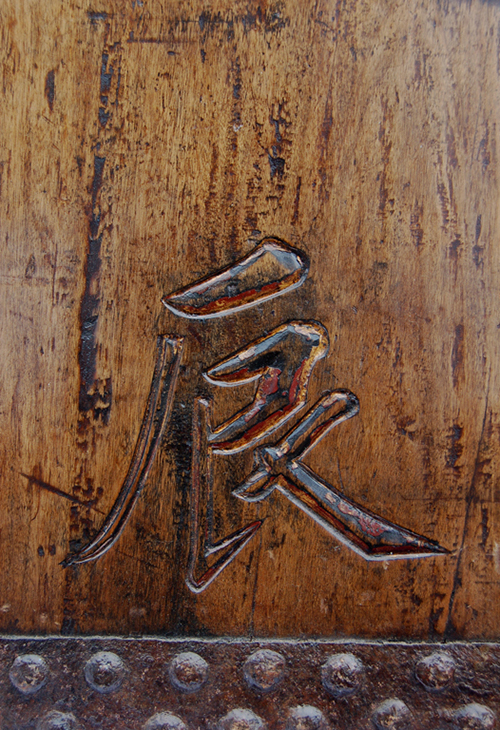 It is supposedly associated with easy wealth in Chinese astrology. As for the North Star, it does not move but is surrounded by other moving stars. This represents two meanings: 1. A country being well run, at such, people would follow where the virtue and spirit is. 2. Referring to someone with deeds of high virtue and being respected. This pair of hanging plaques is decorated with iron fitting which shows that the plaques might have come from the more remote and the inland area in northern China or that is close to the north. This wonderful poem composed of two verses (right and left, reading from top and downward) shows the vast geographical setting in which one imagined and indulged with profound feeling in the contrast of the ancient and the presence under the celestial stars while traveling. The two verses correspond to each other word by word or term by term, such as ancient to presence, North to South, East and West as supposed to South and North, etc. 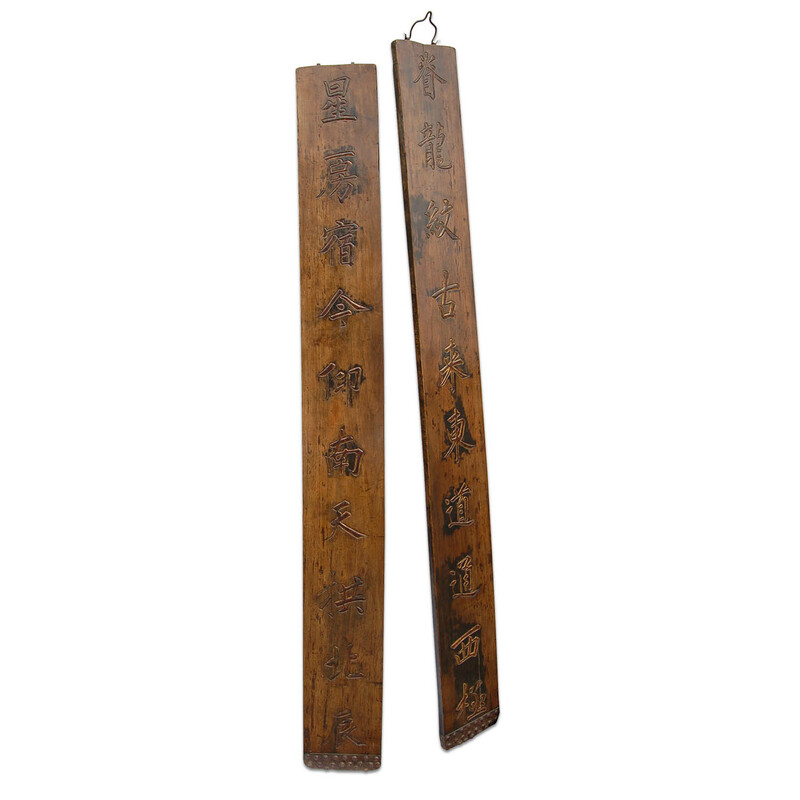 This pair of hanging calligraphy plaques, called “Dwei-Lian” when in pair, were probably hung at the entrance or a main hall of a building either on the posts or on the wall. 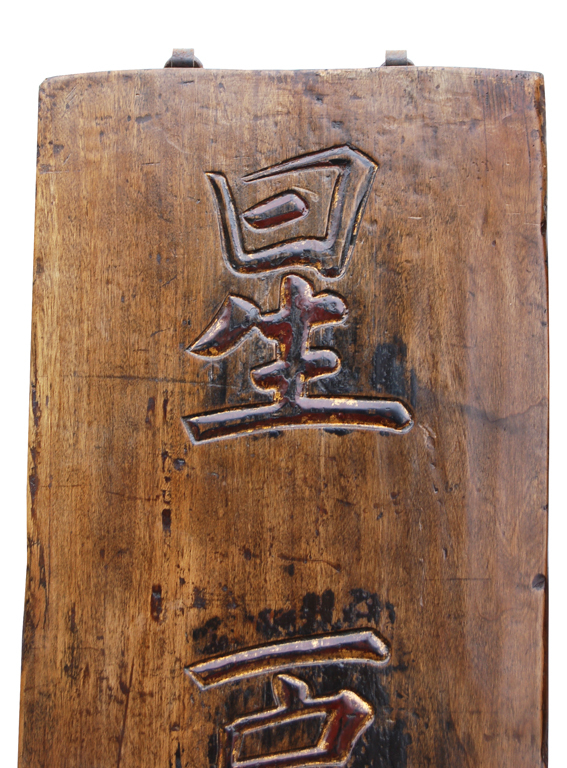 Carved calligraphy plaques are an important part of the Chinese woodwork as cultural relics, not only because they show beautiful carved calligraphy with wonderful and fascinating poems, but also because some of these poems carved on these hanging plaques, especially the ones carved with signatures, can sometimes be the only records of the written poems or phrases from particular famed poets, calligraphers, and/ or scholars, not to mention the depth of literature and calligraphy and woodwork as art that they offer, whether with or without signature.